I usually wear jeans, but today I decided to try something different. I tend to wear less colour than most of the people in Tallinn, but I still have some bright pieces. I don’t like when colours clash. Feeling comfortable is also important. I got this dress from Zara, because it is comfortable and I like its hidden pockets. Instead of street style I get my ideas from Global style. Traditional clothes have incredible details and are really inspiring. I try different things I have found from second-hands or that my aunt has found for me. Today I wanted to explore the ways of using this dress. I got this bag from Morocco, dress and shoes come from some shop in France. I love these shoes and this summer I have been wearing them constantly. I have many other summer shoes, but you always have your favourites. In winter I tend to wear more black, but as I’ll soon go to Brussels and it is warmer there, I don’t need to think about winterwear for awhile. I’m bit skeptic about all these ‘original’ styles e.g. Gothic style. These people follow their style bit too religiously. Very often their uniqueness has the opposite effect and they all look the same. I used to waste a lot more money on clothes, but now I prefer to spend it on travelling. My girlfriend finds me cool clothes. I’m starting jewellery design course this year at EKA (Estonian Academy of Arts). I really like to use weathered and textured metal in my work, but I actually don’t wear many accessories and jewellery myself. I like to hunt for treasures at second-hands stores. I’m from Sweden and when I travel I like to go to local thrift markets. Most of my clothes come from places like that. I buy designer goods only when they are on sale. Overall street style everywhere is quite uninspiring, there are unique people, but for example in Sweden half of the nation is wearing whatever H&M offers. I usually choose one piece of clothing that really suits the day, today it was this skirt, and build my outfits up from that. I like to buy from here and there and only later on think how to combine everything I have. I like when people go for their own thing, but most of the people seem to be too afraid to do that and instead follow their friends. I’ve always had a bit babydollish style. Every season I bring in some new elements, this year these have been shorts. They are an essential when it is really warm, yet look very cute. I also have a pair of shoes with bows that I absolutely love. This autumn I’d like to find a pair of slouchy boots that would carry the same feeling. I design my own clothes and everything I am wearing today is made by me. I dress my girlfriends too, we want to be different. At the moment I am really into 80’s glitz and glamour, it is sort of bursting out. This autumn I’ll be wearing a lot of high-waisted jeans and skirts. My style is sort of a mixture of nerdy and cowboy style. I like to be daring yet simple. I am trying to find nice boots for this fall. I’m thinking about maybe red cowboy boots or just some red boots. My favourite colour is brown. We are on a vacation here with Stan, but we come from Paris. The most important thing for me in finding clothes is that they would fit nicely. I’m quite skinny and therefore it is sometimes difficult to find what I like. I am also into cowboy style and leather. I definitely need some new cowboy boots for the autumn. I love empire cut tops and dresses and this summer I have been wearing quite a lot of it. Well, obviously the essential aspect of style is looking great, everything else comes later on. Next trend I’d like to experiment are ankle boots. 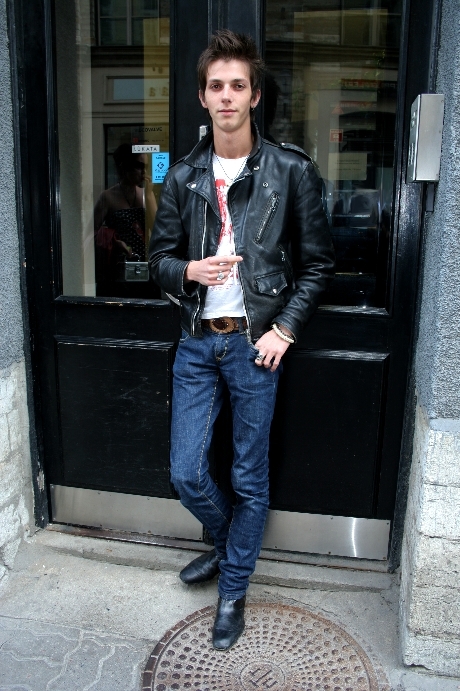 I’d be happier if there were more stylish men in Estonia. Well, my style is bit like a planned arbitrariness, but in the same time it isn’t. I like to combine some random things and not to look too put together. I have had this style as long as I remember. I buy from second-hands and especially from Humana. I’m usually wearing my own designs, but when I really need to buy something I prefer Von Dutch and Ed Hardy. 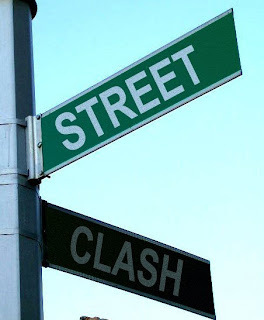 I get ideas from everywhere and I mix different styles – hip-hop, punk etc. Estonian street style will improve, when people become more open-minded, till then there will be many people with rather stagnant style. I usually shop at second-hands and abroad, but the clothes I’m wearing come from some random shops. This morning I went to Viru Centre, spent there 10 minutes and got these clothes. Therefore it could be said that my current style reflects the lack of sleep and a certain amount of alcohol. Well, the most important thing about my clothes is that I need to like them and they have to look good on me. Something may be nice on others, but it doesn’t mean it would suit me. It might sound like a cliché, but my favourite labels are Diesel, H&M, Pepe Jeans and Jack&Jones. 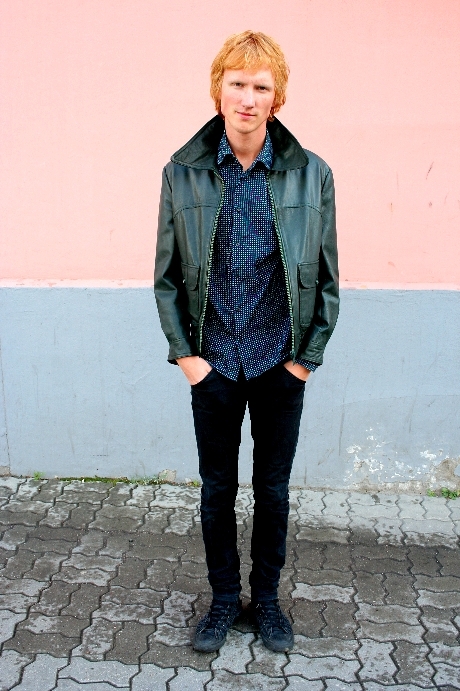 I think, or at least hope, Estonian men will start wearing more fashionable clothes in 5-6 years. I’m a model and already seen a little bit of the fashion world, and one thing I have understood is that it is pointless to follow any trends. You should create them. I’m quite an impulsive buyer and don’t have any favourites. There isn’t one dominant style in Estonia as it is in many other countries, and this is positive. I get a lot of stuff from abroad, but recently I spent a month collecting money for one pair of Diesel jeans that I liked. I tend to prefer skinny jeans. I don’t like when people complain that Estonians aren’t brave enough in their fashion choices- it would be even worse if they wore outrageous clothes and wouldn’t pull it off. I want to be able to wear whatever I want and I recommend this to everyone. Estonians have a potential to be really stylish – we like clothes, but we need to be more original. If I have time, I like to design and make my own clothes. Tomorrow I will go to a Moulin Rouge theme party and I have been searching for pictures from that era and they have been really inspiring. Today I am wearing quite smart clothes, because I spent a day in office. I like 60s style and short dresses. I like to shop at second-hands shops, because you can find unique clothes from there. I sometimes read Elle to keep up with the latest trends. I really love brands and designers’ clothes. Today I am wearing D&G and vintage Dior. This summer I love shorts, especially Johnson’s shorts. 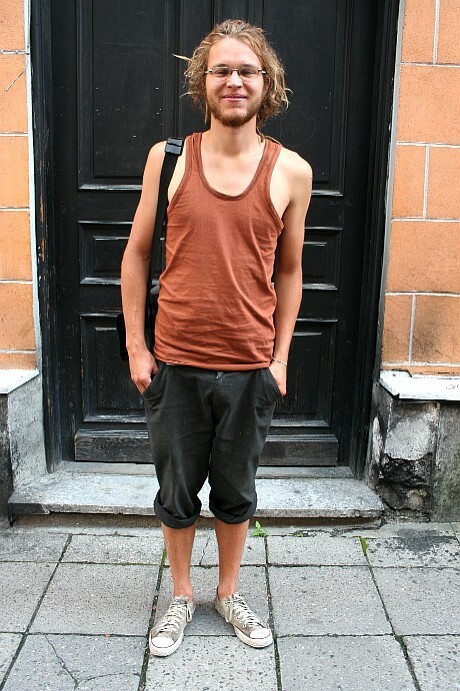 I think people here tend to wear bit too over the top clothes, while in Sweden people are rather minimalist. Less is more. I work as Zara’s branch manager, I have to keep up with the trends. This autumn I am really looking forward to wearing oversized XXL coats that look gorgeous combined with leggings. I always have something black in my wardrobe. I think Estonians are bit trendier than people in the other Baltic States. I live in Sweden, but I always spend my summers here. I don’t have enough time to look around what others are wearing, but it seems to me that people here and there both put a lot of effort into their clothes. I like to mix brands with second-hand finds. Ordinary blue jeans are my favourite. I just got this bag from a handicraft shop near here. I like to mix’n’match second-hand purchases with my other clothes. This summer I have bought many dresses, because they are airy and it has been really warm. I sometimes read magazines for ideas, and one of my favourites is Bon. Piercings are an essential part of my style. My current favourites are also beanie-hat and red/white scarf. I order most of my clothes from the States, because there aren’t any shops here that would carry my favourite labels such as Circa. I don’t care about what other people wear, what matters to me is my own style. Elisa: My favourite colour is turquoise blue. I buy most of my clothes from smaller shops in Finland. Then it is less likely that someone will walk down the street wearing same thing as me. My latest purchase is brown leather jacket. Maren: I really like pink. I wear whatever is comfortable and different. I would also like to buy a leather jacket, but a black one. I really like unique accessories. I try to wear some colour, but my definite favourite is still black. I never wear tip to toe black, I always try to combine it with something else. I recently went to Riga and people there are a lot braver in experimenting with their, but Riga is a bigger city too. Katarina: I got these trousers as souvenirs from Paris. I think brown colour suits me really well, but instead I tend to wear red. Actually, my favourite colours change so often. Now it may be red, but tomorrow beige. I got this top today for free. Mirjam: I got these trousers as souvenirs as well. I rarely read any fashion magazines, maybe only when I am at hairdresser. Yellow is my favourite colour, but it is really difficult to find nice shades. In shops are clothes in colours like mustard yellow and so on, but not in the right shade. Today is really-really warm and therefore I’m wearing a dress. It’s feminine too, so that’s a bonus. I sometimes read magazines, but not very often. Sometimes I browse Vogues and Elles while shopping, but I never buy them. Before I go to bed, I watch FTV, gives a good night’s sleep. I love colours, especially orange. My current favourite is the same dress I am wearing today, but I like other dresses too. I do most of my shopping in Estonia, I prefer shops like Pro:mod. 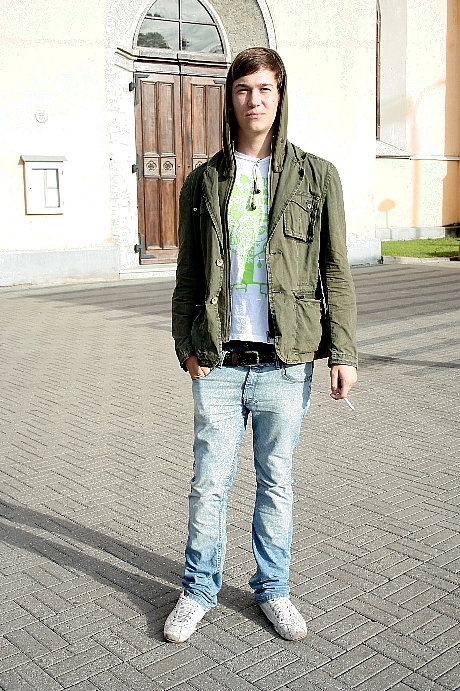 I like that Estonians have so different styles. Ženja: Shoes and sneakers are the most important. My favourites are Vans’ sneakers and slip-ons. I like to shop at Motel Paradise. Today it is “yellow” day. People shouldn’t follow overall trends- it is so stupid. When one person is emo, then half of the Tallinn is suddenly emo. Mari: I shop from second-hands to Surfhouse- I don’t have any preferences. My style changes all the time, usually I don’t wear so many colours, but I feel happy today. 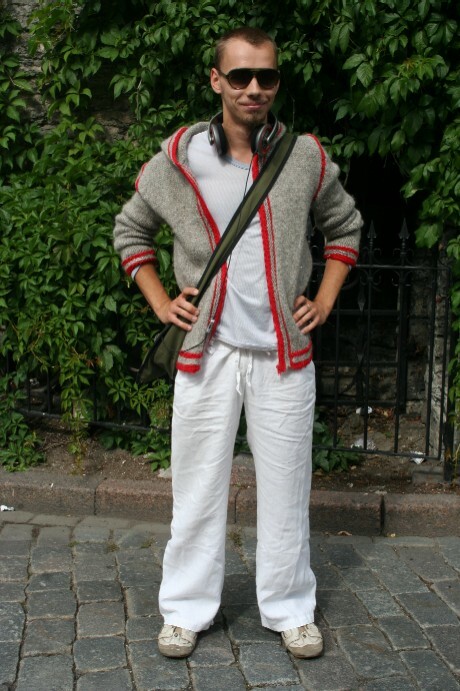 Estonian street style is the same all the time, nothing seems to change. My favourite colours are red and blue, and I always try to wear at least some colour. I cannot imagine any particular influences on my style, but maybe music. Feeling comfortable is main. This autumn I’d like to find a cool coat. I do my shopping in Estonia, there are many great shops in Viru centre. I like comfortable and trendy clothes. 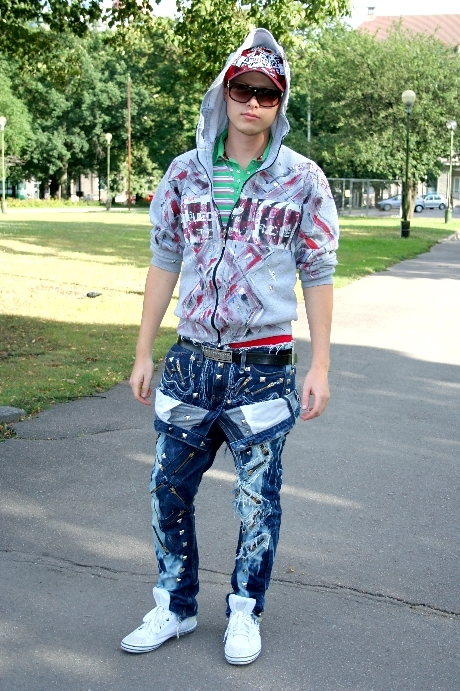 I think Estonians tend to be obsessed with trends- when something is “in”, then everyone is wearing it. I think I might be bit like that too. Kaisa: I mainly shop at different second-hands. Cheap high-street chains would really boost local street style. Most of the shops here have insane prices. Usually we don’t wear dresses, but today is really warm and sunny. Thank you for voting! We made it to the next round. If there is a time to vote again, I'll let you know! This week Tallinn versus Athens. Every day new pictures to vote for! This summer my style choices are influenced by menswear, but I feel that autumn trends will be more romantic and feminine. I work as a fashion designer, hence I try to keep up with the latest trends. My favourites are definitely Vivienne Westwood and Balenciaga. During the day I have a bit bohemian style, but when I go out, I tend to wear more classical and feminine clothes. This summer I adore golden flats and short dresses. This dress is by BCBG. My other favourites are high-street labels such as Topshop, but also designers, especially Marc Jacobs. In summer, spring and autumn I try to wear as much colour as possible, but in winter my favourite is definitely black. Although it is summer, I’ll wear black for my school reunion taking place later today. My ultimate favourite designer is Roberto Cavalli. I would like to get one special order jacket with silver detailing, but otherwise I think I have everything I need. I really hate when young people try to look the same as their friends. It makes them and their style quite boring. I try to customize my clothes. These jeans used to have only one hole in them, but I felt as they needed more. I am into feminine dresses, but my style changes quite often, because I like to follow fashion trends. I look up to some celebrities as fashion icons, but not as role models, for example Gwen Stefani has a great style. For autumn I’d like to buy a pair of UGG boots. This summer I have really fallen for all kind of tots and spots. I like them in every size and colour. I don’t actually care much about fashion and I think this makes me quite different from most of the women. I tend to wear more sporty clothes too. Estonian street style is developing and improving as social and economic welfare improves. People need to be braver in their fashion choices. Today I am wearing a sweater from Paris and a bag from Humana. One day I might wear skinny jeans, another day straight cut ones, but I always try to keep my overall style the same. My favourite label for sneakers and slip-ons is Vans. I buy most of my clothes from the States or England. 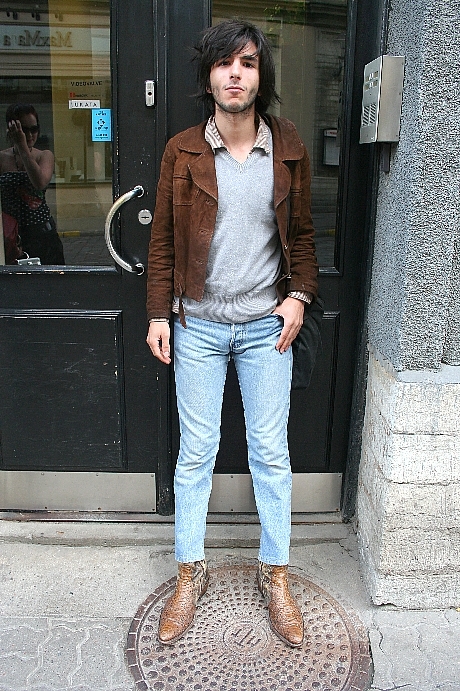 I always try to be unique and therefore all my clothes come from flea markets or trift stores. I really like old-school and vintage clothing. I am really into art and especially into comic books. I find them really inspiring. Kairiin: I always try to be different from other people. At the moment I am longing for a electric blue leather jacket. I think Maria Juur has a great unique and quirky style. Mari: Feeling comfortable is an essential, but I also avoid fashion trends. I think I have reached the point where I have all the clothes I want. All my ideas come from my head and I am not really interested in what is happening in Paris or Milan. One thing that is important is that colours would match and not clash. Last year I saw a green leather jacket and I regret I didn’t buy it. Now I am trying to find a similar one for autumn. I have my own style and therefore I don’t follow any fashion trends. I listen to punk music, and as you can see, it influences my style. I like to buy my clothes from second-hands and then customize them. My favourite colours are black, green and red. I have really many pairs of jeans and sneakers. This summer I would have worn more skirts, if only weather had allowed. Sometimes I like to do some people-watching and see what other people are wearing, but I don’t have any favourites.